General Information - Redwood N.S. "We want Redwood N.S. to be a school where each individual is cherished for their own unique traits and personality, and where each individual can develop their own talents to the utmost, having regard for Christian values and in accordance with the guidelines set out in the Revised Curriculum"
Redwood N.S. 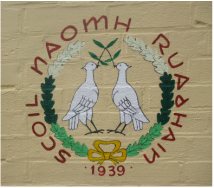 is a two-teacher rural school with 2 learning support teachers situated off the main Birr / Portumna road in the parish of Lorrha.